Tapestry weaving by Susana Negre shown in the home of Jacquin Headen. Artwork shown by Marcus Jolly. 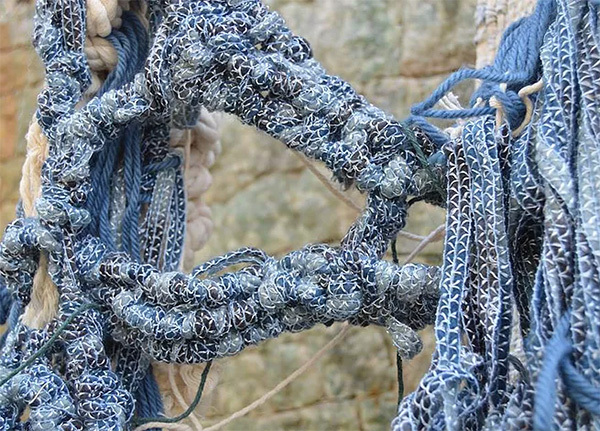 Our Artist Spotlight today showcases weaving & textile artist Susana Negre who has sought creative inspiration across the globe, from her hometown of Barcelona, to London, Mexico, and all the way to Brazil. Susana’s goal is to blend old world techniques with new ideas to create something never seen before. She describes her work as non-traditional tapestry weaving. 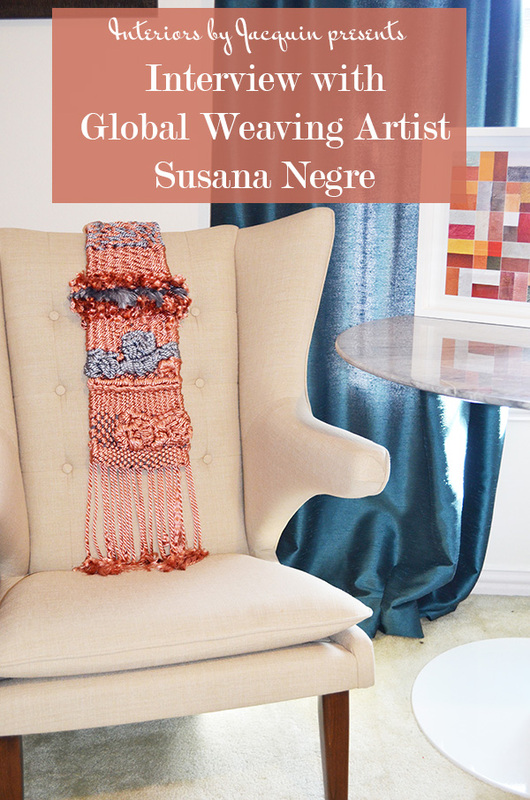 Weaving artist Susana Negre of Barcelona. Jacquin: What attracted you to weaving as an artform? Susana: Although I am now focused on my true passions of art and textiles, previously I worked internationally as an event/art producer. I discovered weaving in 2013, however, I think my attraction to the textiles medium began much earlier in my life. I went to Teraninya School in Barcelona where I was introduced the fascinating world of textiles. Through conducting weaving workshops, I decided to specialize in the artform full time. 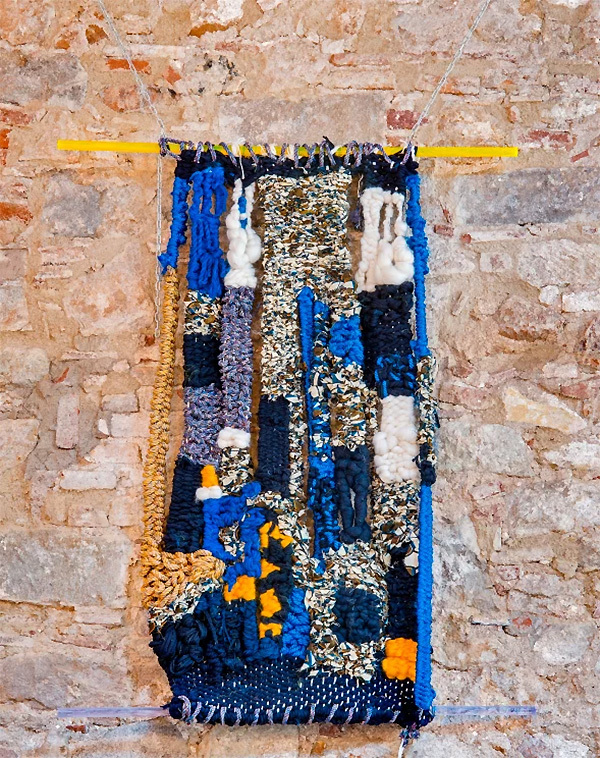 Negre textile art is inspired by art, fashion, design, architecture, interiors, culture, travel, photography, cinema and the great value of hand-making and crafting. Jacquin: How has living in Rio de Janeiro inspired your work up to this point? Susana: The creativity of the people, the colors of the sea, and the tropical rainforests of beautiful Rio de Janeiro have had a huge impact on me! Location and scenery have always affected my artwork. It is difficult to explain why I feel the need to travel for inspiration when my hometown of Barcelona is such a creative and beautiful city. Experiencing new cities allows me to gain fresh inspiration. I have recently relocated back to Barcelona where I am pursing my masters degree focusing on weaving & textiles. Susana Negre volunteers in Rio de Janeiro as she teaches a weaving workshop. Jacquin: Have you had the opportunity to introduce your local community to weaving in some way? What has been the best part about getting into the community with your weaving art form? Susana: Yes! While I was living in Rio de Janeiro last year I had the opportunity to work as a volunteer for a NGO called PIPA SOCIAL run by Helena Rocha. 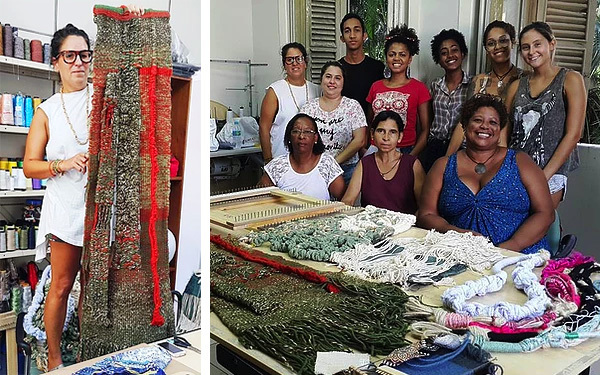 It is a creative hub for talented people, mainly women who live in low-income communities in Rio de Janeiro, with a focus on establishing professional connections and promoting social inclusion. Their mission is to invest in a Talent Bank of entrepreneurs working in the fields of art, crafts and fashion, helping them achieve professional qualifications, improving their ability to find work and generate income, and providing exclusive consultancy services. My job as a volunteer was teaching tapestry weaving & creative knowledge to the beautiful and talented craftswomen, designers and artisans who were interested in learning tapestry techniques. We met once a week where we collectively created a small collection of different items such small handbags, scarves, and miniature tapestries for home decorating, We used the traditional tapestry techniques to develop their crafting and design skills, then allowing them to apply their own unique style. We had a goal to help them to generate new products and income for themselves through sales. It was truly a privilege for me to be able to share my time and knowledge with everyone. Jacquin: Tell us about your process creating a tapestry weaving. Susana: My working process is very intuitive. In fact, I have never drawn my weaving designs in advance. I refrain from thinking, and allow my creativity to find its way. However, I do have a very clear idea of the materials, textures and colors I want to use before starting a weaving.My designs are heavily textured with vivid colors. 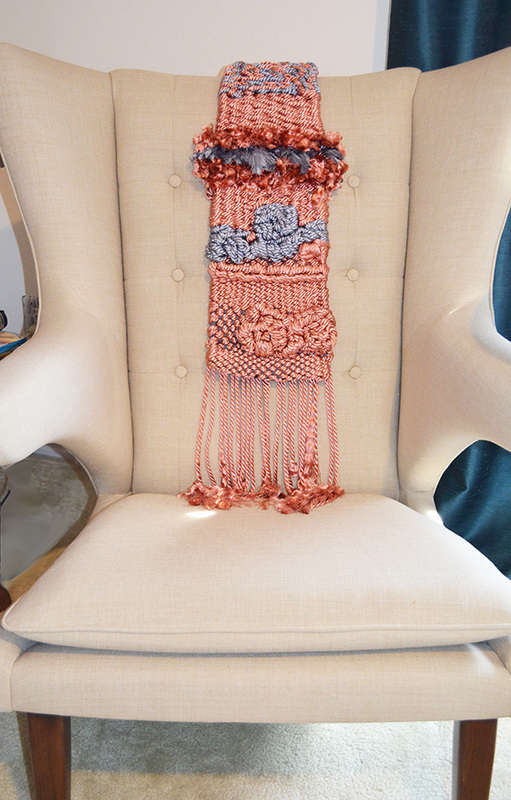 Most notably, my textiles are always handwoven, combining traditional handcrafted techniques of knotting and weaving. The interpretation of my work I leave up to the viewer. There is a different quality of something that is hand crafted rather than machine made. My work is still emerging, and I want to keep pushing myself to create something unusual. In some senses, my work is growing with me. In terms of the process, it is difficult to say how long it takes. It can take me from just one day to up to 6 month to create a large piece; it always depends on the size of the work and the time I have to weave. Jacquin: Are there any weaving projects that you are eager to try in the future? 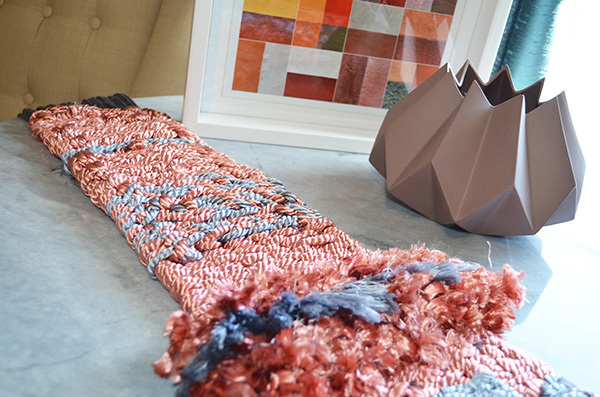 Susana: I would love to get involved in an international project, working with local textile artists worldwide. I would also like to continue doing social projects worldwide. 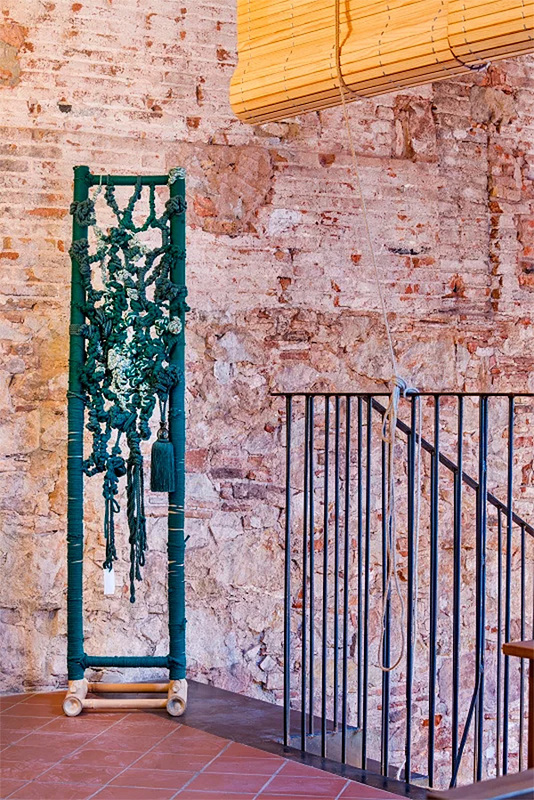 Learn more about Susana Negre and her artwork here.